Jamie Plummer scored 11 of her 15 points in the second half and grabbed 13 rebounds to lead No. 2 Richmond (17-3), which led just 19-17 at the half before breaking things open in the second half. 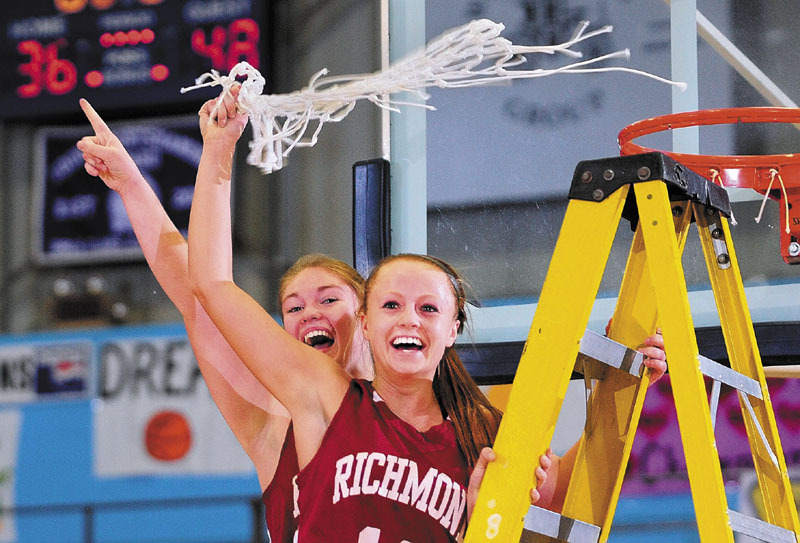 AUGUSTA — Richmond senior Jamie Plummer was quiet and contained in a sluggish first half Saturday afternoon in the Western D girls championship game against rival Rangeley. She was loud and explosive in a dominant second half, which made all the difference in a 48-36 victory that propelled the Bobcats into the Class D title game for a third consecutive year. Plummer scored 11 of her 15 points in the second half and grabbed 13 rebounds to lead No. 2 Richmond (17-3), which led just 19-17 at the half before breaking things open in the second half. Ciarra Lancaster also scored 15 points while Noell Acord added seven for the Bobcats, who will meet Washburn at 1:05 p.m. Saturday at the Bangor Auditorium in the Class D state final. Washburn (21-0) beat Richmond each in the previous two state championships game. Top-seeded Rangeley, which led just once (3-2), finished 19-2. Abby Abbott scored 12 points and Blayke Morin added 10 points and as many rebounds to lead the Lakers. Tori Letarte finished with nine points as well. But Seve Deery-DeRaps and Taylor Esty, two consistent scoring threats this week at the Augusta Civic Center, combined for just six points. Rangeley made just one field goal in the first quarter and, despite Plummer’s early struggles, quickly fell behind 16-7. Then it was Richmond’s turn to go cold. The Bobcats shot 1-for-11 from the field in the second quarter and headed for the locker room up 19-17. “We kept it close in the first half,” said Esty, who grabbed nine rebounds. And that, Deery added, was the goal from the get-go. Lancaster scored seven points in the opening three minutes of the quarter, including a 3-pointer, and the Bobcats were off and running. Lancaster scored eight points in the third. “In the second half we had to step it up and we wanted to get the ball inside,” she said. The confidence carried over into the third, when Plummer took over. She scored two quick baskets on offensive-rebound putbacks as Richmond stretched its lead into double digits, 37-27 about midway through the quarter. Plummer then sank a 3-pointer from the wing with 2 minutes, 40 seconds left in the fourth to give Richmond a 44-31 lead.